Back in March, “Everbody’s favorite photographer” John Crooms and Kemi Bennings of Evolve! 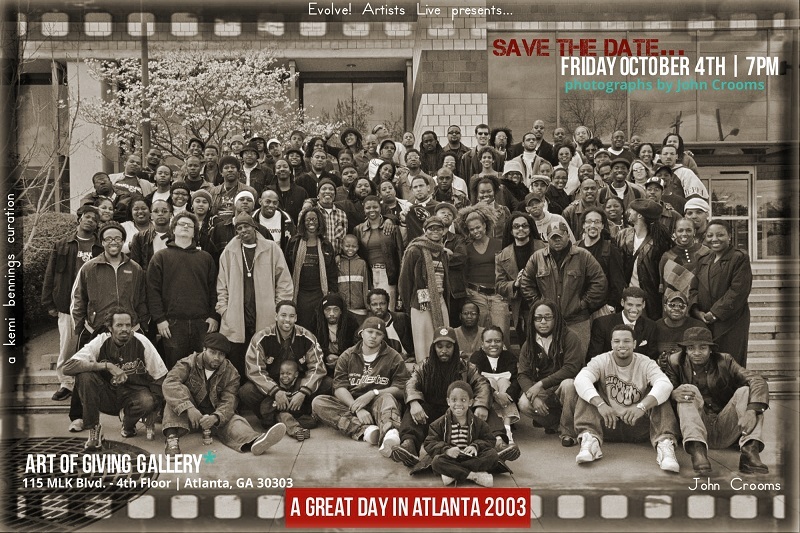 Artists Live invited the movers and shakers of Atlanta’s cultural scene to a reprise of the “A Great Day in Atlanta” photo shoot in honor of the photo’s 10th anniversary. Bennings first pitched Crooms on the idea in 2002 after seeing the “A Great Day in Harlem” photo circa August 1958 at an artist gathering in Washington, D.C.
Crooms took the original “A Great Day in Atlanta” photo on the steps of the Woodruff Library at Clark Atlanta University on March 30, 2003. Both photos, along with other images by Crooms, will be exhibited at Art of Giving Gallery on Friday, Oct. 4, at 7 p.m. The show is Crooms’ first solo exhibit, and Bennings is determined to make it special for him. She plans to include “multimedia aspects, captions, things that might now be considered our artifacts in representing the people in the arts and music scene, pop-up performances, a nice reception and congratulatory toast,” according to the Indiegogo page dedicated to the exhibit. Here’s more on why the photo is significant. ← ChanteSez … We’re going ‘up’!